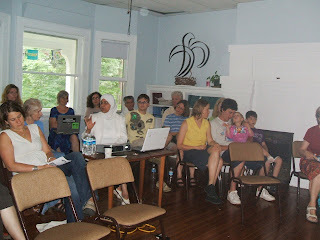 Faiza gave a presentation last night at Asheville Friends Meeting. We had about 30-35 people show up to hear about what has happened in Iraq and the projects Faiza is working on. One project is a water treatment project, which is funded for Veterans for Peace. This was started in the 1990’s and has recently been revived, since clean and safe drinking water is a problem in many areas of Iraq. The other project Faiza is working on is the ‘sewing machine project’ which the local Vets for Peace and Peace & Earth Committee of Asheville Friends Meeting have taken up as a cause. This project will get sewing machines and materials to Iraqi widows, so that they can make clothes for their children and families, and then make clothing to sell on a market. The sewing machines are able to be powered by foot treadle. You can talk to Susan or other members of P&E about supporting this project. Every once in a great while, the Meeting is moved to broadcast its discovered truth to a wider audience, or as the Friendly expression goes, “speak truth to power.” Our Meeting has made such public proclamations in two principal areas: the peace testimony, and the testimony of equality. Click here to read the history of our Meeting’s discernments around the so-called “War on Terror”, the 2003 invasion of Iraq, and the equality of people of all gender identities and preferences. The WNC Peace Coalition is sponsoring a number of events to mourn the fifth anniversary of the US invasion and occupation of Iraq. On Mar 17, a film will be shown at Pack Library. Mar 18, the names of all US service personnel killed in Iraq will be read at the corner of Lexington and Hilliard, near the French Broad Food Co-op. On Mar 19, there will be a rally at First Congregational Church after which citizens will disperse to various high traffic locations to witness to the public. On Mar 20 there will be a rally at Pack Square at 5pm. Finally, on Mar 21, Women in Black invite the public to join with them at Pack Square in their weekly vigil for women and children who suffer because of the wars men wage.